The southeast area of Hyrule was dominated by a vast lake called Hylia. Several hidden caves sat on its shores — even one lined with ice. The lake itself was dotted with whirlpools, telltale signs of the rough currents just below the water's surface. But before Link could swim in its crisp, refreshing waters, he had to take a trip further north. You could head straight to Lake Hylia first if you like, but the truth is, you won't be able to take full advantage of the wonders that is has to offer unless you venture further north first. Travel back to the Magic Shop with the witch outside. (And if you haven't retrieved a Mushroom from the Lost Woods, and traded it to the witch for some Magic Powder, now would be a good time to take care of that). If you recall, there was a boulder in the path preventing you from traveling any further. Well, thanks to the Power Glove, now you can lift and remove the obstacle. You'll find some interesting places beyond the shop. In northeastern Hyrule, a network of rivers tumble over several falls before flowing on to irrigate other areas. Hylians reported that a beast who ruled the waterways lives at the foot of one waterfall. Some of them actually saw it, but others fled in terror after feeling the earth rumble when they neared. They called the beast Zora and the site became known as Zora's Falls. Above the Magic Shop and the first bend of the river is a waterfall that some people claim is mystical. They say that it is possible to actually walk through the wall of water to a room beyond where a beautiful Faerie Queen sometimes grants wishes. The beautiful Faerie who lives behind the waterfall is said to value and reward honesty by travelers' wishes. If you push through this mysterious waterfall northeast of the Magic Shop, you will discover a pond in a cave. When you are prompted, you can select an item from your inventory to throw into the pond. No matter what you throw in, a Faerie will appear and return them to you. 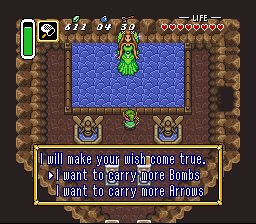 However, if you toss in the Boomerang, the Faerie will give you a better Magic Boomerang in return, but only if you answer her questions honestly. Likewise, if you toss in your normal Shield, she will reward your honesty with the Red Shield. Also, when you throw in a Magic Bottle she will fill it with Green Magic Potion. All other items will be returned unchanged. In the region around the lake live Land Crabs, Octorocks, and other denizens of dry land, but in the water are Zora's Spawn, treacherous currents, and an island that is home to the Fountain of Happiness. On the lake's west bank lives a Fortune Teller who will sometimes give advice, always for a price. 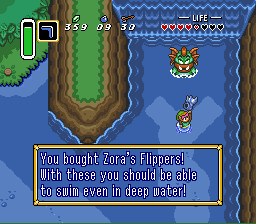 People who have Zora's Flippers can swim in Lake Hylia and the rivers that feed it. Zora created a water transportation system by which swimmers can enter a Whirlpool in one area and emerge in a distant place. 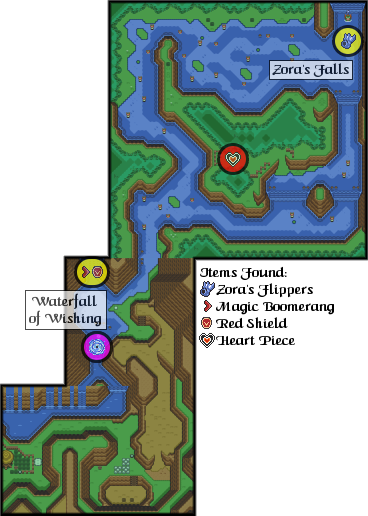 The Whirlpools make for quick journeys, and swimmers who discover how to use them can, for instance, dive into a Whirlpool in the eastern part of Lake Hylia and end up far away, near the entrance to the Lost Woods. Another in the south of Lake Hylia takes travelers to a pool near the Waterfall of Wishing. A third whirlpool in the swamp area ends up near the Magic Shop. (Dark World travelers reported that a fourth warp connected the site near the Magic House to southeastern Lake Hylia.) Not all Whirlpools are safe, though. Many of them are simply signs that Zora's Spawn are about to appear. Look for the Whirlpool icons on the maps. 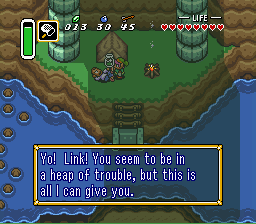 Another Fortune Teller lives on the bank west of Lake Hylia. He conjures mystical stories of the future for inquisitive or lost travelers. Hyruleans quickly learned, though, that it is useless to return to the teller before their previous fortunes have been realized. 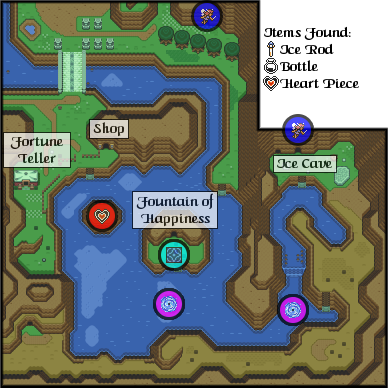 The Shop by the lake is one of the oldest in Hyrule. People traveling by water find it a very handy place to stock up on Red Potions, Hearts and Bombs. Another of the mysterious tiles that supposedly transported people to the Dark World was discovered on the island just outside of the entrance to the Fountain of Happiness. Hyruleans covered it with a heavy stone for good measure, but they were little worried by it because of its location on the remote island. As children, Hyruleans heard stories about a Fountain of Happiness, and many of them searched for it as they grew older. They believed that if they found the fountain, and threw Rupees into it, a Faerie will appear and grant them the happiness they sought. The large island in Lake Hylia is rumored to be a place of magic. Once you have the Flippers, you can plunge into the water and swim to the island. There you will find a cave, and in it a pond. When you approach the pond and peer in, you will receive a message. This is the Fountain of Happiness where travelers throw Rupees into the water in hopes of receiving a prize. When you finally throw 100 Rupees into the pond, a Faerie will appear and offer to give you the capacity to carry more Bombs or Arrows. Return often, and boost both your Bomb and Arrow holding capacities to the maximum. The maximum you will be able to hold is 50 bombs and 70 arrows. It will cost 1400 Rupees total. It should make you very happy. 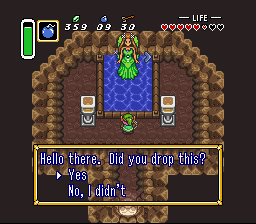 While searching Lake Hylia for useful items, you may find yourself swimming out of the lake and up the river. If you swim around a bend and under a bridge, you will find a man in the shadow of the bridge, blowing smoke rings beside his campfire. The camper wants to be left alone, and he will give you an empty Bottle to be used for storing Potions or other things, so that you will leave. It's important to look everywhere. Travelers who venture all the way around Lake Hylia might discover a remarkable cave. The entrance looks like any other, but inside it is completely covered in ice, and tiny Faeries hover around a Faerie ice sculpture. A side exit leads to another room, which is also iced over. In the center sits a Treasure Chest, but ice blocks prevent awe-stricken travelers from reaching it. There must be some other way to enter the room. 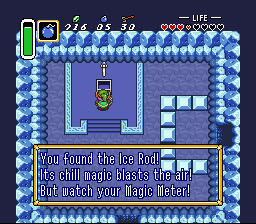 After Sahasrahla gives you the Pegasus Shoes, he tells you to get a strange mystical weapon called the Ice Rod, which is located to the east of Lake Hylia. When you travel south of the lake and then up and around to the lake's northeast corner, you will be able to see a cave entrance, but just to the left of that entrance is a pile of loose rocks. Bomb through the rocks to reveal another entrance. Step inside to claim the Ice Rod. There is a tale in Hyrule of a Good Bee that will fight beside its master. After the battle, unlike other bees, the Good Bee waited until it was netted and returned to its Bottle. 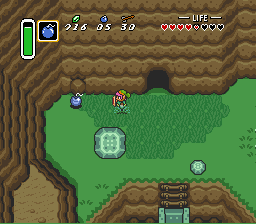 You will discover the Good Bee in the Ice Cave on the eastern shore of Lake Hylia by using the Dash Attack against the statue of the Faerie. You can carry the bee in a Bottle, and release it during battle. If the Bee gets lost, it will return to the Ice Cave. There's also a little trick you can do using the Good Bee. If you release the bee when searching for the flute at the Haunted Grove, it will fly direct to the spot you have to dig, and it will be there as long as it takes to you get the flute. This page was last edited on 12 March 2019, at 06:57. This page has been accessed 178,065 times.